What Rachel Maddow should ask at the Democratic Candidates Forum. How they think about the Supreme Court could be their most important qualification. 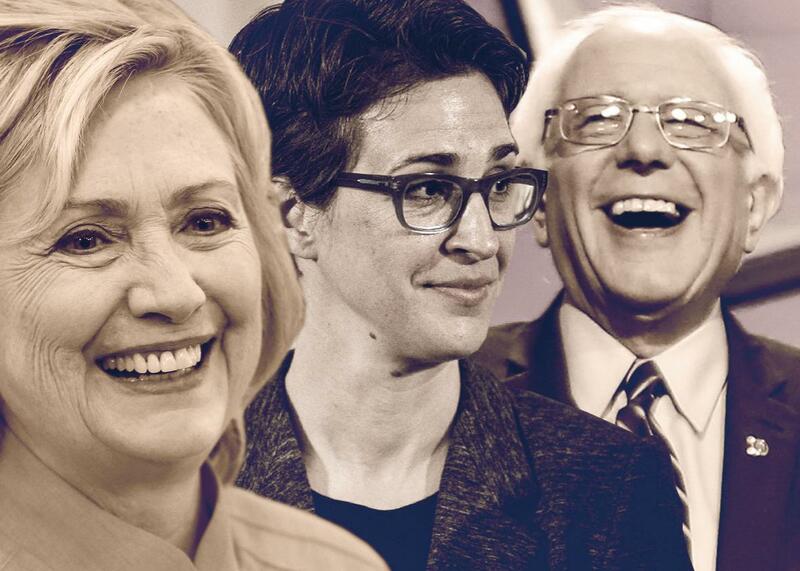 Rachel Maddow, center, should ask Hillary Clinton and Bernie Sanders tough questions about the Supreme Court. Friday evening, the three Democrats running for president will meet for a debate with Rachel Maddow, in what’s being billed as the “First in the South Democratic Candidates Forum.” This isn’t an officially sanctioned debate, so the three candidates will sit down with Maddow one-on-one to discuss important issues that affect the entire country and the South specifically. One of the issues that has received enormous attention in the GOP debates has been the Supreme Court. The Democrats, though, haven’t discussed it much. This is a long-standing trend, reflecting a significant gap in enthusiasm between the two parties. We saw it particularly in the second GOP debate, which featured promises to reform the court and relitigate established constitutional law, as well as threats directed at bad justices. Sen. Ted Cruz has suggested the justices should face retention elections. Former Arkansas Gov. Mike Huckabee wants term limits. Ben Carson has said presidents need not obey the Supreme Court’s rulings. Donald Trump thinks his sister might be a good justice. Cruz has called on Justice Anthony Kennedy to resign immediately. And so on. But if the Democratic candidates have been largely silent on the issue of the Supreme Court, the moderators should not be. The composition of the high court will be one of the single most important issues in the 2016 election, and, as Ian Millhiser argues, the impact of future appointments will be not just on specific areas of policy and doctrine, but also on rules about partisan gerrymandering, vote suppression, and the very systems by which we govern ourselves. The Democratic Party itself could be in peril. Yet liberals don’t seem to spend too much energy fretting about the court, despite the fact that Justices Anthony Kennedy and Antonin Scalia will turn 80 next year. Ruth Bader Ginsburg is 82, and Stephen Breyer is 77. You can play out the scenarios in all sorts of ways (President Rubio replaces Ginsburg, President Clinton replaces Scalia, President Scooby Doo replaces Kennedy), and it’s possible that the winner of the 2016 election may seat three or four justices. That will likely change the future of this country for decades. So whether or not we want to hear the potential nominees talk about it, the fact is that we need to hear them talk about it. There is sufficient distance between Clinton and Sanders on gun control, campaign finance, criminal law, the separation of church and state, and other issues that it warrants parsing their views on what a justice should do. And it leads me to ponder what kinds of questions Rachel Maddow should ask of the candidates this week and what kinds of questions we should be pressing the candidates on as the campaign unfolds. This transcends a debate about where the candidates stand on abortion rights or the Seconds Amendment, or voter ID laws or religious freedom, by the way. Those are good questions, but what we want to hear about is how the candidates think about what it means to be a justice and what justices do on the bench. We want to hear the candidates’ views on the court itself, its role in the democracy, and the rules by which it should be bound. That’s a pretty strong articulation of a judicial philosophy and one that was largely borne out in Obama’s high court picks. Certainly Justices Elena Kagan and Sonia Sotomayor have not been Marshall or Brennan. Certainly they have tended to respect the law and act on behalf of the voiceless. So what kinds of questions should Maddow ask of her candidates when given the opportunity on Friday, and what sorts of questions should we ask in town halls and radio interviews and online chats in the coming year? Here’s a start. 1. Four of the sitting justices are in their late 70s or early 80s. Do you think Supreme Court justices should time their retirement so they can be replaced by presidents from their own parties? The late Chief Justice William Rehnquist once said that it was perfectly appropriate for a justice to take account of the politics and party of the president when deciding when to step down from the court. (He noted that deciding when to resign was not a judicial act, so it was not inappropriate to consider who controlled the White House when a justice makes that decision.) Do you agree? 2. Does the phrase “judicial activism” have any meaning as applied to the courts, and if so, what does it mean? 3. What are your thoughts on the role of precedent, and when is it appropriate for the court to reverse itself on a decision such as Citizens United? 4. What are your thoughts on textualism and strict construction? Do you believe that the Constitution is a living document? 5. Is the First Amendment being overused in the Roberts court era to protect “speech” that is not in fact worthy of protection? Recall that many staunch liberals believe that Citizens United was correctly decided. 6. Is it your view that any nominee would have to have a stated position on Roe v. Wade and pledge to uphold that position? 7. The battle between civil liberties and religious freedom is heating up as one of the most important points of constitutional contention. How do we find the balance between these two vitally important liberties? 8. Does a Supreme Court justice’s background matter? Does gender, race, and class shape a judicial outlook? Should it? 9. How important is it to you that the Supreme Court looks like America in terms of diversity, including professional and educational diversity? 10. What are your thoughts on term limits for Supreme Court justices? 11. Should there be cameras in the Supreme Court? 12. Who are your heroes among the Supreme Court justices? If you could replicate them, would you appoint them again today? 13. Why do you think progressives don’t like to talk about the Supreme Court as much as conservatives? 14. Is America “post-racial”? What is the role of the court in resolving issues such as preclearance in the Voting Rights Act or affirmative action in Texas universities? Is the best way to get past race to get past race? 15. Does it bother you that going forward all the liberals on the Supreme Court are likely to be appointed by Democrats and all the conservatives by Republicans? Does that worry you about the Supreme Court’s legitimacy and acceptance in the future? What am I missing? Put your questions in the comments section, and we can follow up before the next debate.